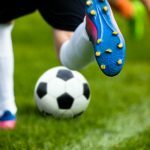 This post was written in partnership with Catelli. As always, all opinions are my own! 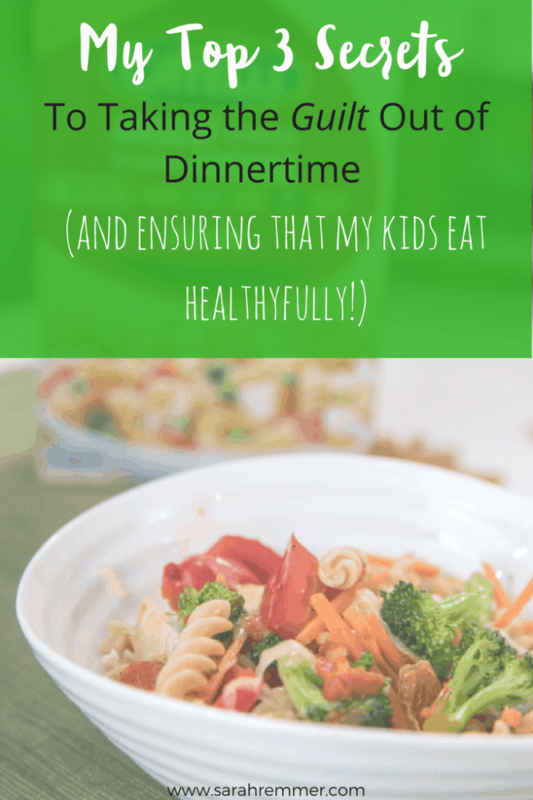 Picture this: You’ve just come home from a long day of work, knowing that you’re solo-parenting your three young kids for the night, and you don’t have dinner planned. The kids are hungry (read: “hangry”), you’re exhausted, and the thought of cooking makes you want to crawl into a hole and hide. I know this feeling all too well because… it’s my life. And I hate to admit this (because I’m a pediatric dietitian who knows better), but sometimes I feel a tremendous amount of guilt and even a sense of failure knowing that my one or more of my kids will probably refuse to eat what I manage to throw together at the last minute. Being a parent is HARD and feeding kids is one of the most challenging parts. 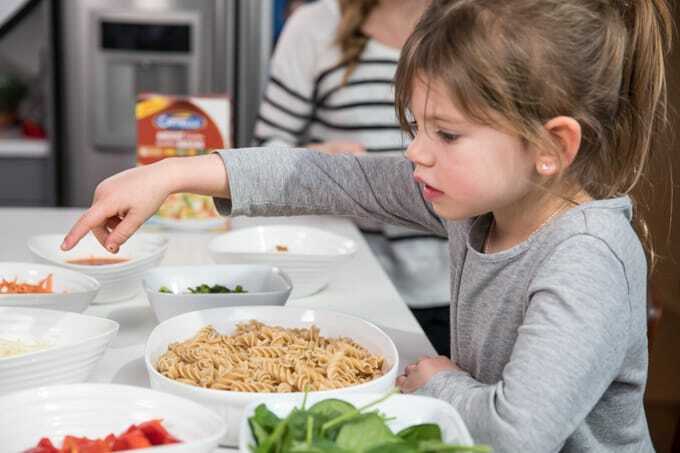 I know I’m not alone here, because according to a recent poll by Catelli, a quarter of Canadian Parents feel guilty that they don’t know how or what to prepare as a healthy meal for their kids. And almost HALF of parents say their kids refuse to eat the food they’ve served at least once a week. Rest assured fellow parents…this feeding expert feels your pain. You’re not alone! 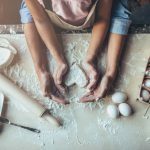 But I’ve decided to stop feeling guilty about not being the “perfect parent” and having every meal planned and organized, ready to throw into the oven when I arrive home, or simmering in the slow cooker. I’m a real mom just like you. And real feels good! Heck, I give myself a pat on the back for small wins like including a vegetable on the table, or choosing whole grain pasta instead of white. 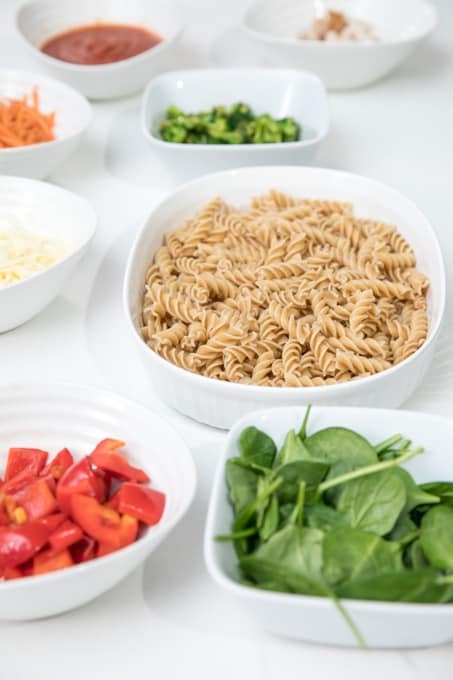 As a dietitian, I love Catelli’s new Ancient Grains pasta because *finally* there’s a pasta that is actually made from whole, ancient grains and loaded full of fibre and nutrition (and that my kids actually eat and love!). I definitely consider this a win! 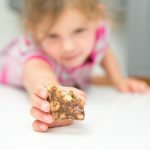 Trust me on this one: the more you pressure your kids to eat (JUST EAT!! ), the more they’ll resist, and the pickier they’ll get. Enter: mealtime meltdown and more (and more) guilt. This is not what you need. Instead, do your job as the feeder, and let your kid do their job as the feeder. What this means is that you provide a semi-balanced and nutritious meal (you guys, this could be grilled cheese with frozen peas and apple slices), at a decent hour, at a family table without distraction. And then…here’s the real ticket…leave the rest up to your child. I’m serious—don’t pressure, hover, coax, force, barter with, or bribe your child to eat it. It’s their job to decide if and how much they eat at any given meal. When the pressure is taken off, they’ll be much more likely to try– and even eat—their food, as long as proper boundaries are set (such as closing the kitchen after dinner and spacing eating times out by at least two hours). 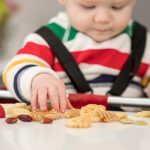 Your kids will quickly discover that they can’t ask for a snack 15 minutes after dinner (after refusing to eat said dinner), and instead learn to self-regulate their intake, with time and patience. Two or more veggies and/or fruits: Fresh, frozen, canned and rinsed all work well! 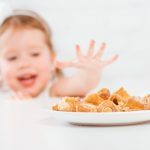 One whole grain: Choose your favourite—whole grain pasta (Catelli’s Ancient Grains Rotini is our all-time fave because my kids can eat it with their hands! ), quinoa, brown rice, whole grain bread, or whole grain tortillas all work well! A healthy fat: oils, avocado, nuts, seeds all count here! Then you lay out the ingredients on the counter or table and then, HANDS OFF—you let your kids serve themselves. You don’t micromanage, judge or hover, you just let your kids decide what they’ll eat (and how much they’ll eat). I explain more of why family-style meals are golden in the video below, so make sure you take a look! 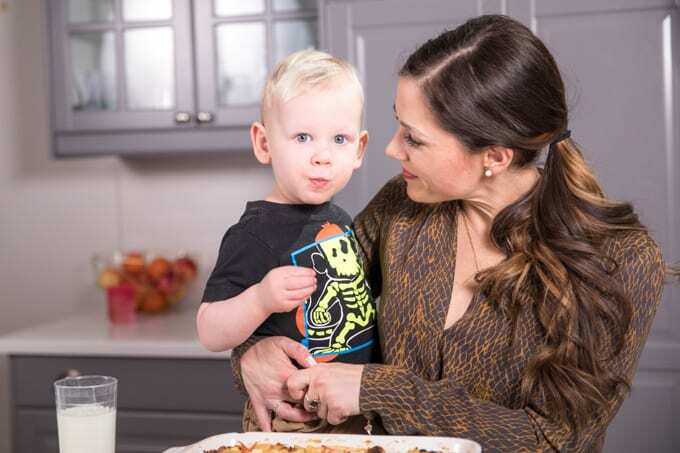 Let me tell you, there’s nothing better than breaking out my go-to easy recipe list—the one that has my favourite quick recipes that I actually have the ingredients for (and that I know my kids will actually love and eat). 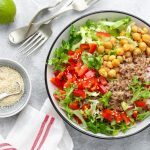 These are the recipes that give me the peace of mind knowing that I provided my kids with a dietitian-approved, tasty, healthy meal like this One-Pot Greek Pasta Bake, or this Southwestern Quinoa Skillet or this super simple One-Pan Thai Green Curry Bowl. 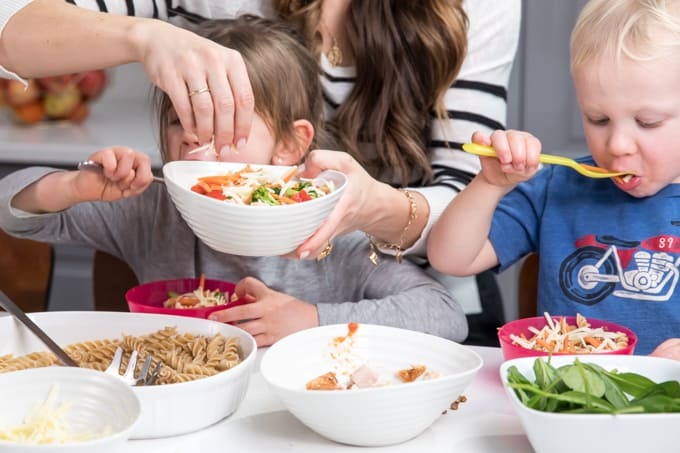 When putting together your list, choose meals that you’ve tested out a few times (and feel comfortable making on the fly), that create little mess, that are quick and easy and that you know your kids enjoy. If you need some inspiration, you can check out my recipe section! Bottom line? 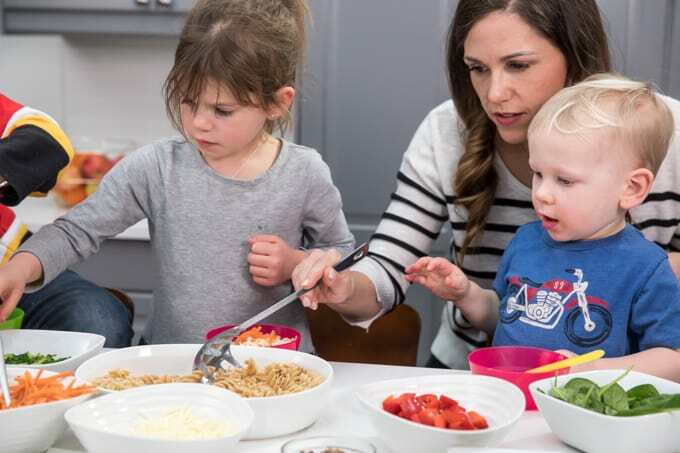 Take the pressure off yourself and your kids at mealtimes, don’t expect perfection, and do your healthy. 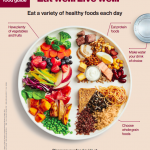 The definition of healthy eating is different to everyone (mine means choosing whole grain pasta over white and serving family style meals often). But even small modifications to your current meals can make a big difference. Remember, “real” can feel good – go easy on yourself! What is your “real” parenting story? Make sure to use #RealFeelsGood when you share this post and your stories! And to read other parents’ ‘real parenting moment’ stories click here: www.realfeelsgood.ca! Love this post! 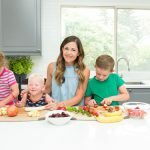 I used to do a lot of pediatric counselling with parents – and taking the pressure off of mealtimes was one of the best strategies! I would get a lot of positive feedback on this. So much great information here! What a great post; thanks for the tips! Great tips! 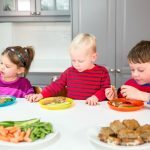 Feeding kids is not easy, I have to check out some of these recipes for sure! Great tips! I especially love your idea to serve things family style. This is how I ate a lot of family meals growing up and it helped keep everyone happy. 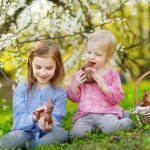 It’s also a great way to let kids feel empowered to make their own food choices and honor their inner intuitive eater. Love it! 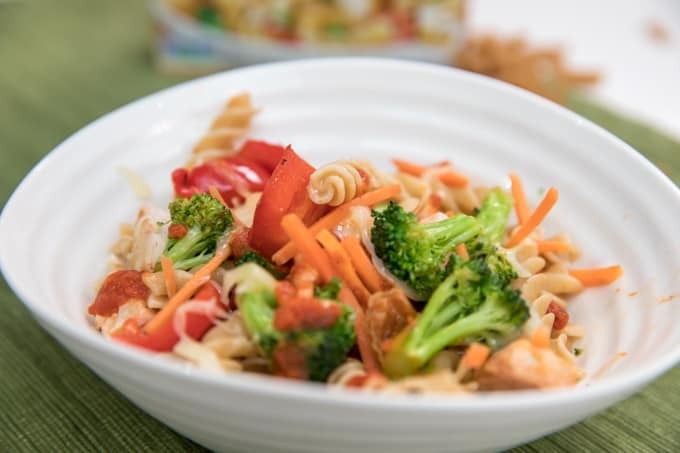 Having a go-to list of meals that are full of pantry staples like beans, pasta, and rice makes it easy on busy nights. Great post! Super great tips. It’s always a challenge to feed a family (and keep everyone happy). Yes! I love this! So many great tips! We, as parents, can make it more complicated at times.